The following story is a speech given May 7, 2013 by Michie O’Day at the Active Communities Conference in Waterville, Maine. I am honored to publish it here with her permission. Michie is an inspiration to me and a heroic example of what it means to be antifragile. 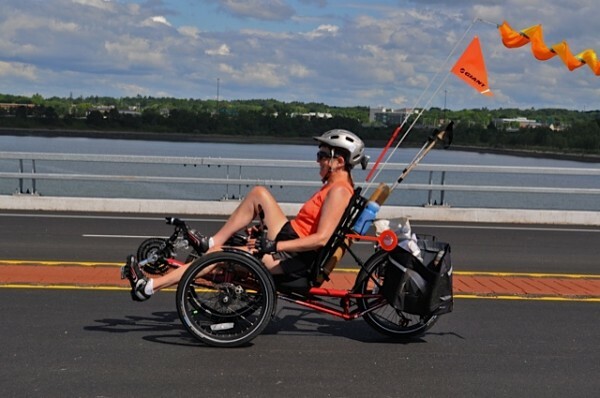 Her journey on the tricycle confirms everything we are trying to do here at I Am Traffic—from education, to legal equality and informed law enforcement to inclusive facility design. Today I’m going to tell you how I became disabled and how I make the most of it. I hope you’ll see that despite the hurdles, I’m an active and contributing member of my community. What I want is for you to return to your communities – all fired up to include more people like me – so that together we can enhance both the social and economic well-being of Maine’s cities and towns. I wasn’t always the way you see me today. My deafness and trouble walking stem from a rare genetic condition known as neurofibromatosis. I’ll repeat that for you. neuro-fibroma-tosis. Let’s call it NF. There’re several strains of it. I have the one known as NF2 – which means that I grow benign tumors in my brain and around my spinal cord. I was diagnosed with this when I was 26 years old. Since that time I’ve had too many MRI scans to count, radiation treatment and 6 major neurosurgeries for a total of 36.5 hours on the operating table. I consider this bragging rights, but I’m determined not to let it become a way of life for me. Fortunately, I’m optimistic, and I’m pragmatic. 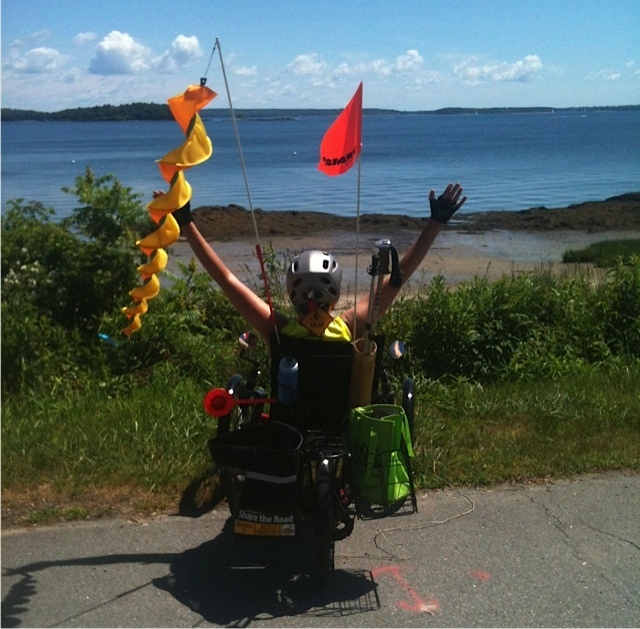 So when my hearing went kaput in my 39th year and I had to give up my career in nonprofit fund raising, which I thoroughly enjoyed, I seized the opportunity to follow my heart and start fresh as a painter in Stonington, Maine – which I loved even more. Balance has been an issue since my first neurosurgery when I had a tumor removed from my acoustic nerve 30 years ago. As a result, I became deaf in one ear and my vestibular function was compromised. I had to give up skiing and cycling at that time. There were other losses and adjustments along the way, but things didn’t get bad until 2008, when further neurosurgery left me with a paralyzed right leg. Wasn’t supposed to happen. With a lot of work and rehab, I was able to regain most of the use of that leg – and I was glad to get out of a wheelchair. But recovery wasn’t 100%, and power walks – which I’d loved since I was a teenager – are now only a memory. Today, I use trekking poles – or sometimes a walker – to make sure that I stay upright. Three years ago when it was clear that my poor coordination was affecting my driving, I gave that up and got rid of my car. Stonington is simply the most beautiful place on earth, and I’d be there still, but it’s remote and not a good place to live without a car. So I moved to Portland, and that’s where my cycling story begins…. I used to walk past Gorham Bike & Ski on my way to the Rite Aid store on Congress St. One sunny day almost two years ago as I was plodding along with my walker I looked at all the shiny new bikes in the window and thought, “Hmmmmm…. I wonder if they sell trikes for grown-ups?” Then I thought, “Nah… even if they do, it would be expensive and I’m still recovering from moving costs.” So I kept walking. I got about 10 feet past the shop….stopped. Turned around and went back. It couldn’t hurt to ask. Fast forward about six weeks, and – thanks to a generous friend – I’m riding home from the shop on my brand new Sun EZ Tadpole 21-speed Recumbent Trike. I cannot describe my excitement to you! It’s great fun to ride – like a go cart, only better – and it’s something I can DO! 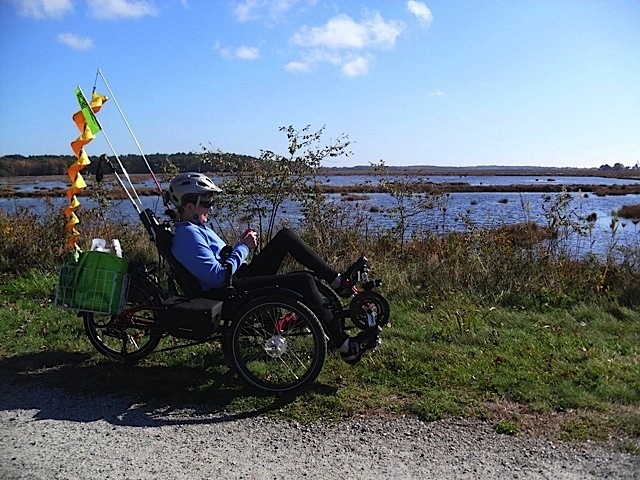 After giving up skiing, snow-shoeing, swimming, hiking, cycling, power walking… the trike opened up a whole new world for me. It was so wonderful, that I upgraded to an ICE trike last summer. ICE stands for Inspired Cycle Engineering, and they do make beautiful trikes. I named mine Ruby, and she’s simply the best…. I was cycling home from Higgins Beach (south of Portland)… happily pedaling along Highland Avenue, which is a main road that goes through some nice farmland and rural areas in Scarborough. That section of the road has a paved shoulder, but it’s not marked as a bike lane. It was sandy and cluttered with recycling containers, so I was riding in the right portion of the travel lane. Cars had to pass me carefully, and a few did. No big deal. Traffic was light that day. Next thing I know, there’s a car pulled up beside me and the driver had slowed down to my speed. I look over… It’s a police car. His lights are flashing, including the red light on top. If his siren was going, I didn’t hear it. (I don’t hear anything.) But I saw that the passenger window was open and the cop driving the car was looking at me and yelling. I pulled over and stopped. The patrolman stopped his car in the middle of the travel lane, lights still flashing of course. He got out, ran around the his car, stood in front of me and started shouting at me again. I explained that I’m deaf and couldn’t understand what he was saying. He was still agitated. I remained calm on the outside, but inside I was shaking. Probably because his holster and gun were in front of my nose…. Through pointing and gestures, he made it clear that I was supposed to be riding IN the shoulder lane, and that no part of my 36”-wide trike should be in the travel lane. I said no, that was not correct and that I had a legal right to use the roadway. Thanks to CyclingSavvy, which I’ll tell you more about in a minute, I knew what I was talking about. But he wasn’t buying. He continued to insist and I continued to refute. Eventually, two other cyclists rode by. I flagged them down to help. They stopped and talked to the patrolman. Soon enough everyone calmed down, and I rode on home. End of story? Absolutely not. As far as I was concerned the unpleasant incident was over, but I saw two important training opportunities and wanted to make sure that both happened. I wrote a letter to the police chief who agreed to meet with Jim and Paul to discuss Maine state laws for cyclists. Isolation is one of the biggest challenges of disability. 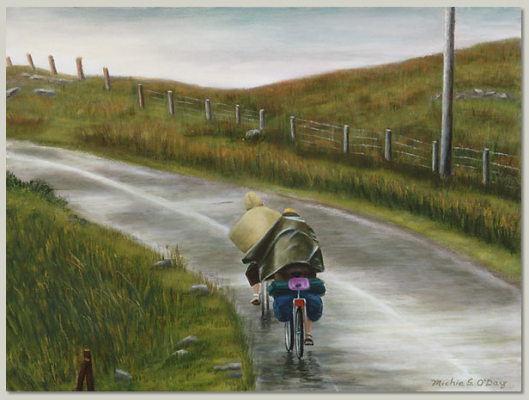 While my art gives me another means of communication, cycling gets me out there and involved – part of the world. The other issue, which was equally important to me personally, and which I am qualified to address, is how to identify a hearing impaired person and communicate with them effectively. A few weeks later, I was able to address a staff meeting of the Scarborough Police Department on these topics. My presentation was only 15 minutes long, but that’s all it needed to be. I made my point. Back to the big picture…. Frankly, isolation is one of the biggest challenges of disability – especially for me due to the combination of deafness and mobility issues. While my art gives me another means of communication, cycling gets me out there and involved – part of the world. Personal independence is another challenge of disability. I gotta tell ya, I love doing my own grocery shopping on my trike and coming home with two big bags of groceries in my rear baskets. It’s great to be able to shop or go out to lunch on my own schedule, get some exercise, and contribute to Portland’s economy. So yes, it may take an entire morning for me to do something that most of you can do in a few minutes… But I do it because I can. So what do I wish for? This is where you come in. I want to be able to cycle safely on roads and designated bike paths. This means better signage & road markings. I want better education for both cyclists AND drivers. This includes – but is certainly not limited to – bike-law education for law enforcement officials. I want standards and best-practices, so that planners and engineers can design roads and bike lanes that are consistent with the rules of traffic movement and safety. 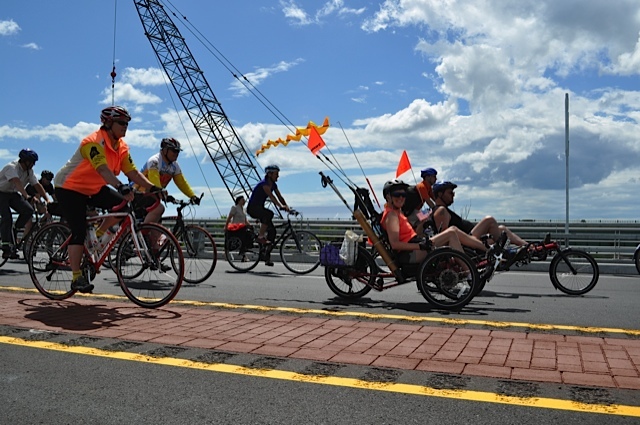 And, I want these lanes & paths to be safe and accessible to all – not just to those who ride bikes but also those us who ride trikes. A good example is the Eastern Trail, south of Portland. It’s a lovely trail… especially that stretch through the Scarborough Marsh. But the bollards – those yellow posts to keep out the bigger vehicles – are too close together for my trike. When I took the trail to Old Orchard Beach last fall, my companion had to lift the 40 lb. trike over the posts so I could continue on the ride. Otherwise, I would’ve had to turn around and go back home. What a disappointment that would have been! Last, I’d love for more people who can no longer ride a bike – for whatever reason – to discover trikes. I want company! As you heard from Eric, Maine Adaptive has an excellent program for that. I ride with them in the summer. It’s great to go with a group at my speed. I only wish they rode more often and went more places. I want to suggest some resources for you. If you’re not familiar with the Bike Coalition of Maine, they’re here today. 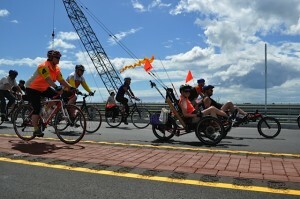 The Coalition is a highly effective organization, and a strong advocate for cyclists. 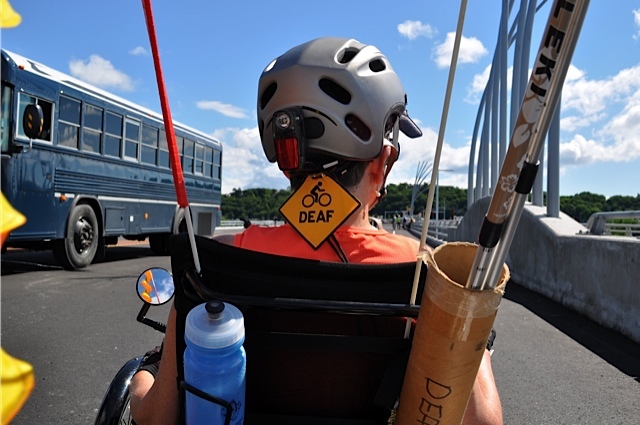 CyclingSavvy is an excellent course on safe cycling, which is available here in Maine. John Brooking is the instructor. I took it soon after I bought my first trike and it still helps me to be a safer and more responsible cyclist. And there’s a new organization being formed, whose working name is I Am Traffic. Their mission is education, and their vision is a world where motorists expect to see cyclists on the road and consider them a normal part of traffic. Likewise, cyclists ride responsibly, making their movements and intentions visible to drivers. I’ve got brochures from all three of these resources for you. And I have my own brochures too. They include my website address if you’d like to see my paintings. So, as you can see, cycling has done many good things for me. It’s made me stronger physically. That’s no small thing for a person with my medical history. It’s made me more independent. I love not owning a car and using my trike to get to the beach or store and other places I want to go. And, it’s led to new friendships. When communication is challenged by deafness, it takes time to meet new folks and some friendships never gel, but a shared passion for cycling is a nice basis for mutual respect and support. I want to conclude by sharing my outlook with you. To counter each loss caused by NF, I’ve always sought to benefit — to learn from it and to become a better, stronger, and more loving person for it. With deafness, the benefit was easy: my art. With the mobility loss in 2008, it was harder, and I’m still coming to terms with that. But I can tell you this: If I could still take my long, brisk walks, I never would have ventured into Gorham Bike and Ski asking about trikes. For years I’ve said when I’m painting I’m not deaf. Now I can add: when I’m cycling, I’m not disabled. When I’m cycling I feel a sense of freedom and empowerment that I haven’t known in years….. I’m out there, a part of nature, and alive. The reason I’m willing to stand up here and speak about something as personal as my health and related challenges is because I want you to see that disabled people have much to offer. Look at us. See us. Make us a part of your world. And if you’re on the road near Portland, and it’s a sunny day, you just might see me riding “Ruby.” Give us a wave. Great speech,Michie! I wish I could have attended. 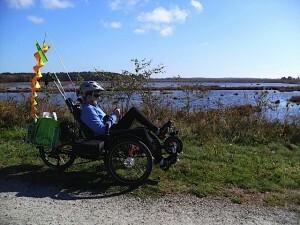 Reading “when I’m cycling, I’m not disabled” brought tears to my eyes. I’m glad that CyclingSavvy and I were able to assist you in your continuing journey. Thanks for representing CyclingSavvy! Thank you John. You know how I feel about Cycling Savvy. It oughta be mandatory, but that gets complicated. Still I dream of much wider distribution. A DVD??? An e-course? Not the same as live instruction but could still be effective. Wonderful Speech – I wish I was there to hear you speak, in person. Being disabled myself, I can totally relate. I was born with my visual impairment and was never allowed to drive a car. It was learning to drive a bike at the age of 28 that helped me break out of my isolation and finally start living a full life. I didn’t hear until now about your encounter with the police. I’ve had encounters like too, so I know how scary it is. I’m glad you stood up for yourself, and I’m glad that others stood with you. I expect to be in Portland at the end of June. Maybe we’ll run into each other. Met Michie at Waterville ACE conference. As an Eastern Trail trustee, I’m already lobbying for support to allow your members/beneficaries to travel the Eastern Trail. Congratulations on your great work. Narrow bollard gaps are already prohibited by national standards. The problem is usually convincing Parks & Rec officials to follow standards for transportation facilities on what they consider recreational facilities. Congress makes it explicit that MUTCD applies to bicycle trails, not just streets and roads, and the American Association of State Highway Transportation Officials has a guide specifically for bicycle and multi-use facilities. The minimum spacing for bollards under current AASHTO guidelines is six feet, specifically to allow safe passage for trikes and wheelchairs. Wow! An incredible speech from an incredible person. Both inspired and inspiring. I hope any who missed hearing the speech will read your words and act on them. You go girl(s)! In part 3 of his overview of cycling law enforcement, Kirby Beck explains what police need to learn and how to get heard by your local police department. What is a Courteous Cyclist? The issue of courtesy often comes up when bicyclists discuss traffic, especially when motorists are part of the conversation. Most bicyclists want to be respectful of others and to set a good example. However, different assumptions, experiences and knowledge about traffic bicycling can result in different opinions of what this means. How can cyclists extend courtesies to their fellow road users, while prioritizing their own safety? We answer that question as it’s addressed by cycling classes such as CyclingSavvy and BikeWalk NC’s Traffic Bicycling course. Do you think requiring bicyclists to have licenses would raise bicyclists’ stature in the eyes of law enforcement and the driving public? Teaching children to travel effectively by bicycle as they get older develops patience, discipline, self reliance and personal responsibility. Learning to negotiate traffic by bicycle also teaches essential driving skills that will make them safer and more courteous motorists later. This presentation explains the root cause of the beliefs that inhibit bicycling in America, why the prevailing strategy can’t fix it, and offers a strategy that can.